The Fall bird migration season is still on. The last couple of days I’ve been trying to squeeze in some birding. In spite of my efforts, the birds have been a little elusive. Challenged, I continue to search in hopes of finding something darling. There were a few surprise visitors at the Manor, along with the usual suspects. Finally getting back to Kinder Farm Park, which has been rather birdy lately, Iset up in one of my favorite spots. I began checking through the birds around me and enjoying the little cuties. And then, WHOOSH !! All of the birds in synchronicity scattered. What in the world caused that? In SWOOPS a Cooper’s Hawk. With his evil and intense ever-seeing eyes. No wonder all the birds left! [ Smiles ] I LOVE your photo gallery of birds! [Smiles back] Thank you so much ! Aww hi cute little squirrel! Thanks ! This is one of the skinnier ones. like my blog also ! The smaller birds and the squirrel are cute and pretty, but that hawk is impressive. 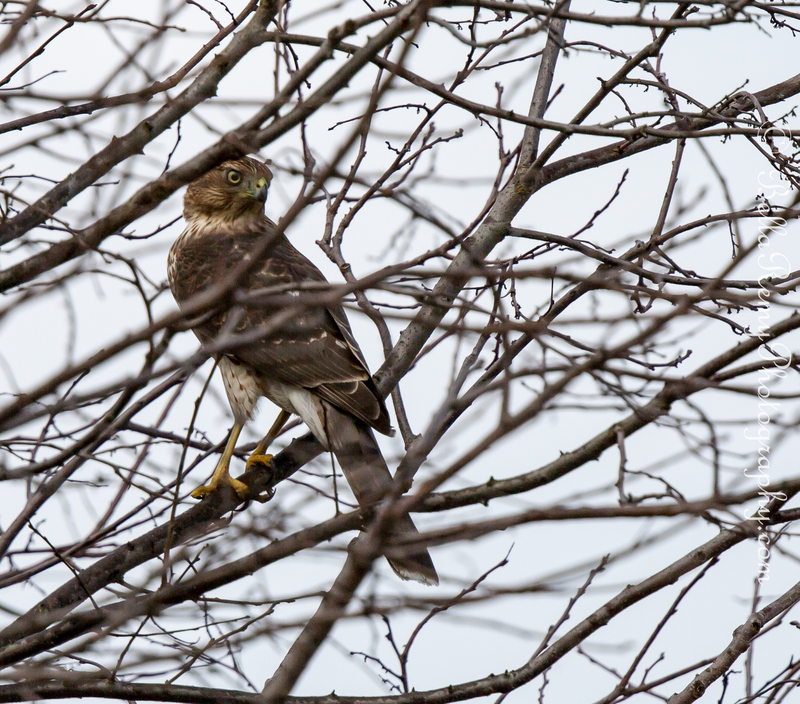 I really like the birds of prey and have never been able to see a Coopers Hawk that closely. Just you wait then Mike ! Tomorrow is a “Birds of Prey” photo workshop. I’ll bring home all sorts of beauties. Just for you! I’m glad you managed to get a shot of the hawk in the trees. I bet it wasn’t easy to capture. We’re off on the road again tomorrow for 2 weeks to the Loire Valley and Brittany, so I might not be on line for a few days. Continue enjoying the autumn and I look forward to seeing your pictures whenever I’m back on line. Oh you do live the life don’t you? Have a safe journey and think of me while you bask in the sunlight. Again… I was admiring all of your beautiful bird captures then…. SQUIRREL! LOL ! But of course I am ! Don’t you love that pose? I tell you, those Coopers have really mean looks in their eyes. I wouldn’t want to mess with them. Thanks! I have to agree that that hawk is magnificent, kinda scary with those eyes! He is clearly master of the universe here! Brilliant captures all! LOL ! You do make me laugh. Thank you so much.